When this book was first published in 1991, political ideology had thrust small-firm issues to the forefront of attempts to revitalize the British economy. In the Thatcher years the emphasis had been on individual enterprise and initiative with the number of small firms increasing rapidly. This was reflected in the growth in the number of specialist studies analysis small-firm revivalism. 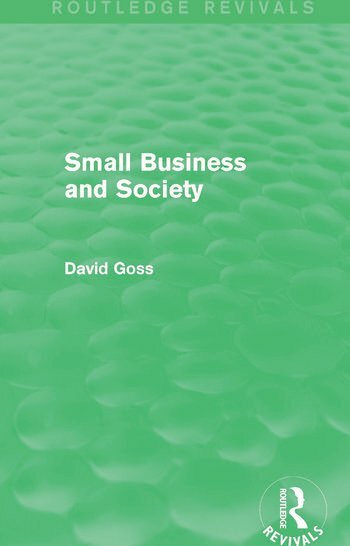 Small Business and Society clarifies the issues and debates that surround the small business and its place in society. In particular, the complex nature of its social role is examined: on the one hand, the entrepreneur can be seen as the innovator exploiting free-market capitalism to strengthen the economy; on the other, employment conditions and industrial relations are said to suffer. Moreover, the growing importance of ‘green’ issues now brings into question the extent to which the small firm benefits the environment. This book will be of interest to students of business and sociology.